Bring some harmony into your life with the Sony h.ear on 2 Wireless Noise Cancelling Headphones. Digital noise cancelling lets you choose what you hear, so you can always listen your way. 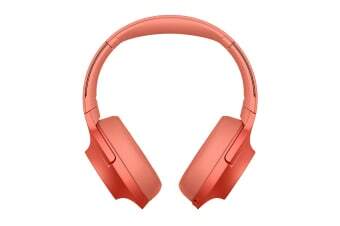 Lightweight and ergonomic, the Sony h.ear on 2 Wireless Noise Cancelling Headphones fold up when they’re not in use. And when you’ve got them on, the soft ear pads stay comfortable all day – a perfect fit for your life. Enjoy the subtle nuances of studio-quality sound with High-Resolution Audio. Passion for music unites every component from signal to speaker, so it feels like the artist is performing right in front of you. LDAC transmits more data than conventional Bluetooth wireless connections, for exceptional sound quality that’s closer to High Resolution Audio. With noise cancelling, Ambient Sound mode and quick attention, you’re in complete control of your listening experience. Touch controls and the Sony | Headphones Connect app make your headphones effortlessly in sync with you. Answer phone calls, control music and activate Google Assistant or Siri – all using simple touch controls. With up to 28 hours of battery in between charges, you can enjoy wireless playback all day. The battery recharges quickly too – plug in for just 10 minutes and you’ll have enough power for 65 minutes of playback.